Meet Wall-E, a 5-year-old Labrador Retriever mix who weighs just about 22.6 Kilograms / 50 pounds and is a toilet-trained fellow. However, he has one of the saddest expressions a dog could have due to one thing. 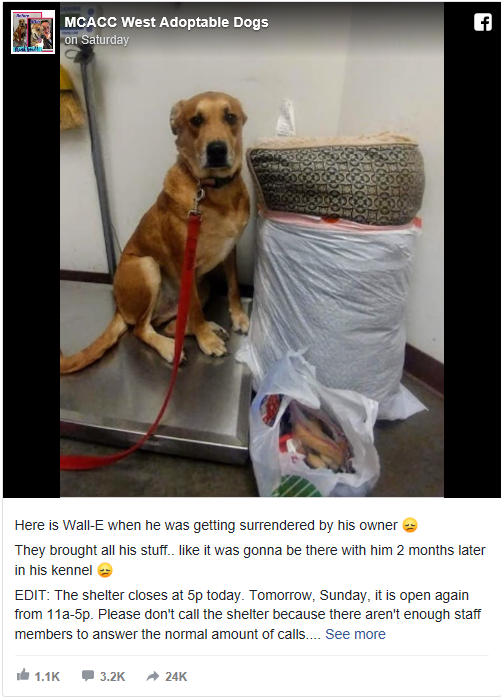 On 24 November, the Maricopa County Animal Care & Control re-told Wall-E’s story on their Facebook page, with a picture of him and his belongings in tow. He was visibly heartbroken. Although the MCACC is the 2nd largest intake shelter in the United States, they are a kill shelter – due to the severe lack of space. Already overcrowded, the shelter was unable to take in more dogs without putting down others – Wall-E might be next. News about Wall-E spread fast, with the Facebook post shared by many, over 18,000 times. Many commenters were interested in adopting the Labrador Mix. Eventually, a woman named Lynn Lee adopted Wall-E on 25 November, just a day after the dog arrived at MCACC – and the rest was history. 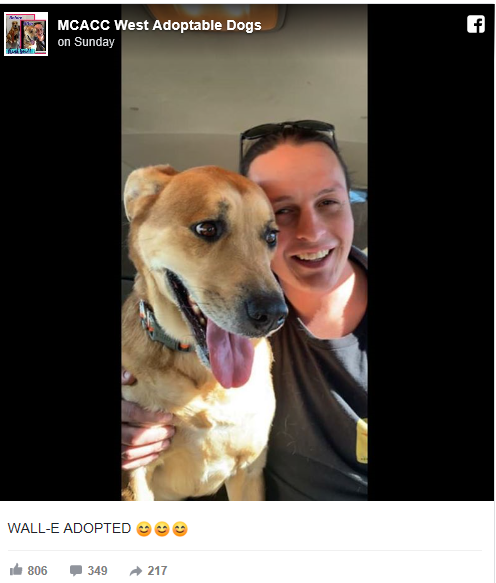 Thanks to social media and the kindness shown by animal lovers nationwide, Wall-E was successfully rehomed and loved once again!